There is something about that 1972 Festival in Sacramento that seems to me rather special. I can't exactly explain it. There was really nothing significant about it being the 27th Annual Statewide Festival. Maybe it is because a sizeable number of us from the North and South, mostly Past Presidents, had found each other and started hanging around together and letting it all hang out. Now let's be sensible. There were several hundred folk dancers there, having a great time, who could care less about us. So let's get back to reality and talk Festival. The Mansion Inn, our headquarters, was a great place to relax around the pool in ideal weather. The Mayor's welcome in the program sounded warm and sincere. Northern president Elmer Riba's greetings and invitation to President Avis Tarvin and folk dancers everywhere set just the right tone. Every sign indicated a fine Statewide and the signs didn't fail. There are any number of historical sights to see in our Capitol City aside from the Capitol Building. Old Sutter's Fort is well worth while and so is the former Governor's Mansion, now open to the public to visit (and we chose!). 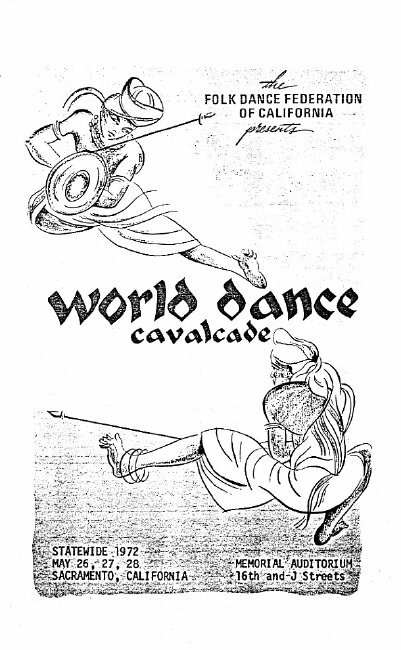 Sacramento has a great facility for Festivals in their Memorial Auditorium at 16th and L Streets and a fitting place for their "World Dance Cavalcade." The auditorium rang with the sounds of music and laughter for the full three days of May 26, 27, and 29, practically day and night as it, too, hosted After Parties and Kolo Parties well into the early morning hours. The Institute and the Picnic were great but the Concert Saturday evening was, shall we say, "the greatest." The Concert program measured up to or surpassed any we have seen so far. 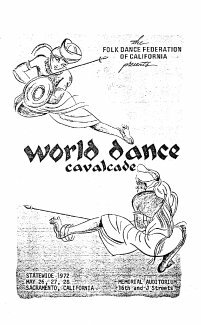 Not only did it list the better than twenty exhibitions, superbly narrated by Nate Moore, but it contained two full pages with names of the individual dancers along with a page recognizing the entire Concert staff. We apologize for not being able to mention them all but you should know that Millie von Konsky was Director and Producer, assistd by General Chairperson of the Festival Committee, Bruce Mitchell; Executive Coordinator, Elmer Riba; Southern California Liaison, Avis Tarvin and Laura Lippett; Decorations, Lawrence Coulter; Stage Manager, Ray Kane; Concert Program; Vi Dexheimer; Artwork, Frank Kane; and many others. At the installation Dinner Sunday evening most all the casual conversation consisted of praise for the Concert. Once Master of Ceremonies Dolly Barnes got things quieted the business of installing officers took place. Some of the key Committee members not already mentioned are: Business Manager, Lawrence Jerue; General Program Recording, Bill D'Alvy; Masters of Ceremonies, Jan Wright; Square Dance Callers, Stan Valentine; Institute, Frank Bacher; General Dance Program, Pat and Hugo Presnall; Registration, Millie Coburn, Picnic, Eldon Kane; Costume Display, Richard Duree; and a lot of others. Sacramento 72, admittedly one of my favorites, will be remembered.